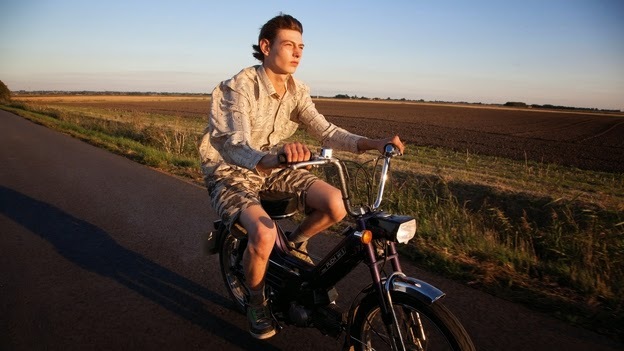 Writer-director Guy Myhill's debut feature, THE GOOB, is a beautifully shot, authentic coming-of-age movie set in the British countryside. It features a typically superb and sinister performance from Sean Harris as the jealous bully Womack - a man so insecure that he even goes after the feckless Goob when Goob manages to pull one of the many girls that Womack likes. The Goob is in fact a 16 year goofy kid called Taylor played by Liam Springs. Scenes with him and his brother and best mate are full of exuberant mischief and perfectly capture that mildly anarchic spirit of our childhood summers. As they caper about the English countryside we can't help but back the underdogs against Womack's control. Indeed, one of the best parts of the movie is an extended pre-credits set-piece where the two brothers nick Womack's precious car keys and go on a joyride. Of course it goes epically wrong when Womack finds out, and this sets us up for the spiralling confrontation that caps the film. In between we have one of the best uses of music in a film, and the wonderful energy of the teenage actors, not least Oliver Kennedy who steals the show with his cameo role as Elliott. One of the joys of the film is seeing how, in a way, vulnerable Womack is. The kids are just so cheeky that even he can't dent their fun. THE GOOB has a running time of 86 minutes. The movie played London 2014. It does not yet have a commercial release date.